South Africa’s oldest city has been reportedly shutdown by protest. The protests which the residents says is as a result of lack of service delivery by the authorities. They are angry among others at the lack of collection of refuse piles and the mushrooming of what they say are illegal structures in the area. 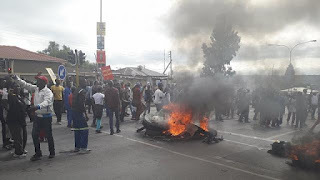 Several roads leading into and inside Alexandra have been blockaded with rubble, burning tyres and rocks, and eyewitnesses reported delays on the main roads outside the area. Herman Mashaba, executive mayor of Johannesburg, South Africa’s commercial city for diamonds and gold industries, is under fire on Twitter after shutdown by its residents.